Preparing for surgery? Fast, don’t starve! Use ClearFast Nutrition Drink to hydrate and nourish before your surgery. Can shorten your length of stay in the hospital. ClearFast contains complex carbs, vitamins, minerals, electrolytes and amino acids. Clearfast is medical grade hydration and nutrition. It was made for patients going into surgery but can also be used to replenish lost fluids from exercise, plane flights, colds/flu and more. 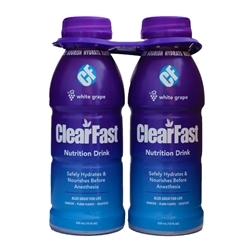 ClearFast Nutrition Drink does not need to be refrigerated prior to being opened, but should be after the safety seal is broken. Sweetened with Stevia. Ingredients: filtered water, maltodextrin, l-citrulline, natural flavors, sodium citrate, citric acid, malic acid, monopotassium phosphate, stevia rebaudiana, vitamin a palmitate, zinc sulfate, sodium selenite.